1-6-2: Measuring the length of the head at the front (face) of the head. 1-7-1: The pocket/net must be completely attached to the head and the side walls, leaving no gaps large enough for a ball to pass through. 1-9-1j: Beginning January 1, 2021, a goalkeeper chest protector designed for lacrosse that incorporates the NOCSAE ND200 at the time of manufacture shall be used by all goalkeepers. 4-5-9: A shot is considered a ball propelled toward the goal by an offensive player with the intent of scoring a goal. A shot can only be made when the ball is parallel to or above the goal line extended. Additionally, it can be either thrown from a crosse, kicked, or otherwise physically directed. b. The ball is touched by a player of either team other than the defending goalkeeper after hitting the goalkeeper or his equipment, goal posts or crossbar. 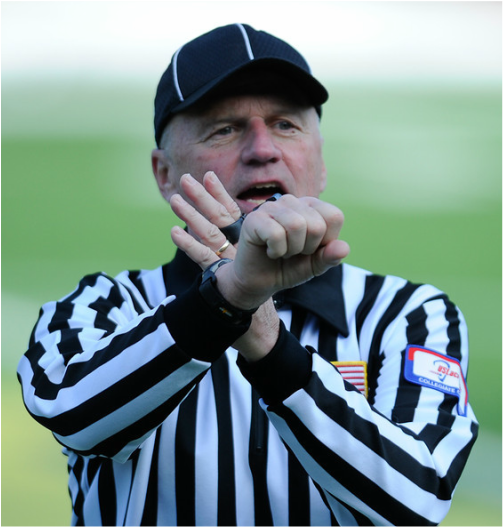 4-14-3: If the ball does not touch the center line or something over the center line, no infraction has occurred. A defensive player may reach over the center line with his crosse and bat the ball to keep it in his team's offensive half and thus prevent an over-and-back violation. However, he may NOT reach over the center line and bat the ball with his foot or any other part of his body excluding his gloved hand wrapped around his crosse. If he does so, it shall be a turnover. 5-3 PENALTY: Penalty for violation of Article 5 is a two- or three- minute, non-releasable foul, at the official's discretion. An excessively violent violation of this rule may result in an ejection. 5-4-4: A player shall not initiate a body check legally but slides up into or follows through to an opponent's head or neck. 5-4-5: A player shall not body-check a player in a defenseless position. This includes but is not limited to: (a) body-checking a player from his "blind side;" (b) body checking a player who has his head down in an attempt to play a loose ball; and (c) body-checking a player whose head is turned away to receive a pass, even if that player turns toward the contact immediately before the body check. 5-4-6: A player shall not initiate targeting, which is intentionally taking aim at the head/neck of an opponent for the purpose of making violent contact. This could include a check with the crown of the helmet (spearing) that targets the head or neck of an opponent. PENALTY: Three-minute, non-releasable foul. An excessively violent violation of this rule may result in an ejection. 5-4-7: A player shall not initiate targeting that intentionally takes aim at a player in a defenseless position. PENALTY: Three-minute, non-releasable foul. An excessively violent violation of this rule may result in an ejection. 5-10e: A coach who is on the field and obstructs play. 5-12-1 PENALTY: Three-minute non-releasable penalty for a player, substitute or non-playing team member or a one-minute non-releasable penalty for a coach and ejection for the remainder of the game. The ejected coach shall be removed from the premises (bench and field area). The ejected player, substitute or non-playing team member shall be removed from the premises if there is authorized school personnel present to supervise the ejected student. If no authorized school personnel is available, the student shall be confined to the bench area. The sponsoring authority is responsible for notifying the appropriate school of the ejection. 6-3-2a: A player shall not use the portion of the handle that is between his hands to hold an opponent, when his hands are more than shoulder-width apart. 6-3-3e: Holding is permitted if a player uses the portion of the handle that is between his hands, which are no more than shoulder-width apart, to hold an opponent on the torso with no more than equal pressure and no thrusting motion. 6-5-2b(4): A player shall not exchange his crosse with that of a teammate during live play while the ball is in either crosse. 6-11-2: A player in possession of the ball with both hands on his crosse shall not use his hand or arm to push the body of the player applying the check. NOTE: Illegal body checks (5-3), "spearing" (5-4-3) and unnecessary roughness (5-9-3 SITUATION E) shall be strictly enforced as personal fouls.